I guess I was ignoring the messages or at least trying to. Yesterday, mice were even mentioned in my horoscope so I decided it's time I paid a little more attention to these critters. I have written about mice before when they made themselves known to me. http://pixiedusthealing.blogspot.ca/2010/11/mousetraps-boundaries-and-chakras.html Back then I understood the mouse message to be about a lack of boundaries. It felt like the mice had invaded my space and I saw the need to be a bit tougher, or at least clearer, on what I wanted to "let in" and "let go" of. "make a dispassionate assessment of your strengths and your limitations without judgement, and be completely honest with yourself." Mice are not really a creature that lays around in the hot and humid weather we are experiencing these days to consider what should be done or analyze choices for the upcoming winter mouth. It runs around like crazy; scurries around, is the popular phrase. It's busy building nests, storing food, and organizing projects I guess. My "issue" with mice is that they are in fact- too fast and furious. You see them out of the corner of your eye and you're never really sure where they might turn up next, and there's a good chance they might just run over your feet while you're thinking about that! But while we humans are considering all those things about the mice- they are actually "doing their thing" in a very focused intentional way. They are getting stuff down and getting things in order. Perhaps they are planning the "take-over" while we're still wondering if, in fact, that really was a mouse we saw! It hard for me to imagine "calling on Mouse". But that is what Steven Farmer suggests you do if you need that kind of focused energy. You aren't really "calling on the mouse", or asking for one to appear in your kitchen. When you use spirit animals, you call on the spirit, the energy, the vibrational level of the creature; in this case, Mouse. In my opinion, that's a totally different thng and I want to keep that separate- boundaries again. Mouse energy is helpful when you feel overwhelmed and disorganized and you want to get some kind of order in your life. Now, that's what I'm taking about! And if that's the message that the mice were bringing, although I might be a bit slow on the draw- I think I'm finally catching on!! 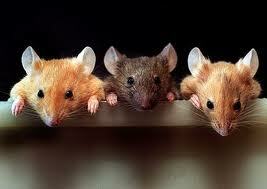 Mouse energy is helpful when you are feeling unproductive and you want to get motivated to pursue some project or task. It sounds like Mouse energy resonates with the Bach Flower essence Hornbeam. http://pixiedusthealing.blogspot.ca/2010/09/hornbeam-for-monday-morning-feelings.html It's a helpful essence when you just can't get the focus to get started on something. It's indicated when you just can't get moving in a forward direction. When you can't figure out where to start. When you're stuck. In might just be me, but I think humans in general can be pretty good at getting overwhelmed to the point of disorganization. Sometimes it feels like there are so many things coming at you that you should do, could do, might do, want to do, that you have no idea where to start. So you flip around from one thing to the other, scurrying around with half finished projects. Before you know it, your head is caught in a mousetrap. You were so distracted by that huge piece of cheese that you missed, all the great pieces of food along the way as well as the gigantic steel and wood structure the cheese was precariously balanced on! It's as though we get so distracted by what we think the big picture might be that we miss the obvious clues and the details along the way. Not many mice actually get caught in the trap. They are much more aware of the details to fall for that foolishness. It's humans that are always trying to "build a better mousetrap". We keep missing the point. For now at least, I think I'll decide that spirit sent me one mouse to get the message across. Maybe because I wasn't really paying attention, spirit sent a couple. But I'm listening now. I am going to consider all the plentiful opportunities and resources available to me, focus on the task at hand and look at what is obvious and right in front of me. "Message received, mouse you can move on"....I've got work to focus on.